In Winter, I was yearning for warm weather and Sunny days so that I could post more recipes with pictures taken in bright light. But when its summer, time is a big constraint in doing so. I am really struggling hard to post at least one recipe per week. I am pretty sure that might be a common thing most of the bloggers have to hurdle to keep it going!!!! Last year we went for strawberry picking and ended up with tons of tiny strawberries as the harvest season was almost over. But it was a fun packed activity to enjoy with family. I made my first batch of strawberry jam last year. Even though they were very tiny strawberries, they were very sweet and were deep red in color. Later I experimented with blueberries and they were a hit in my family. This year we didn't go for any berry picking. 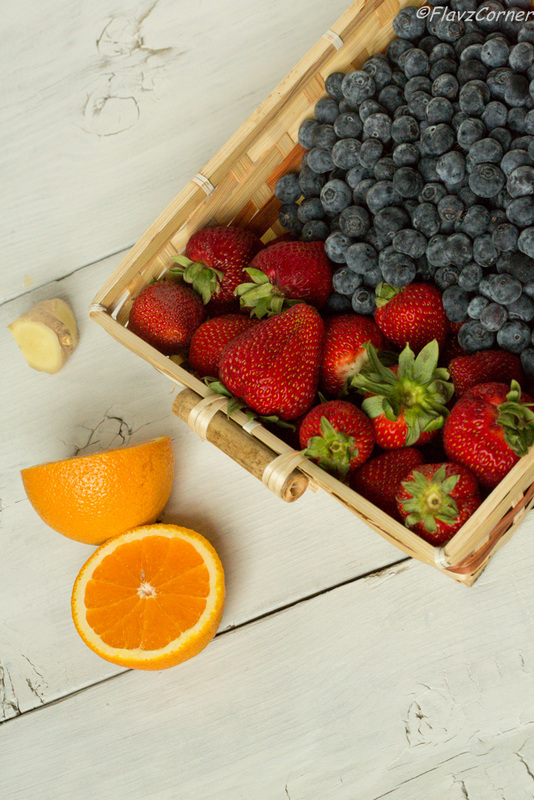 But our local farmer's market were loaded with blueberries and strawberries as they were in abundance this year. So I decided to try a mixed berry jam with some twist. Since my first batch of experimental jam was a success, I went for a bigger batch this time. I was really happy with the results and was able to share with my family too. These jam bottles when packed and labeled could make a good gift for family and friends. If you happened to go for berry picking or ended up buying lots of berries, then don't think twice, try this recipe and you will be not be disenchanted. After all, what can be better than a homemade with love 'Mixed Berry Jam' :). Take a deep heavy bottom sauce pan. Add the strawberries, blueberries and sugar to it. With a potato masher or a big wooden spoon, mash the berries well. Add rest of the ingredients to the pan and cook for 1 hr on medium heat. Stir occasionally to bring the froth down. 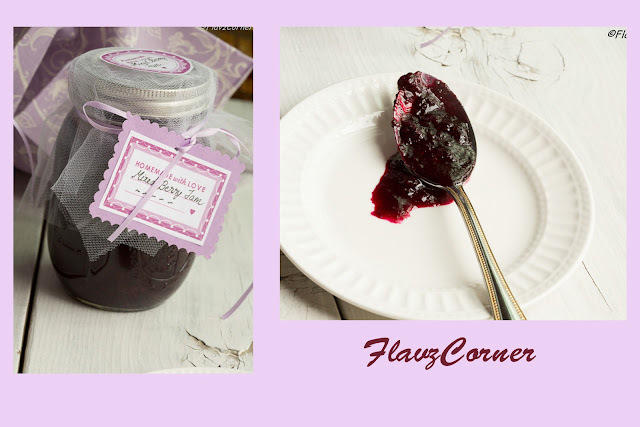 After 1 hr take a cold spoon and scoop the hot jam and drop on a plate, if the jam looks thick enough and not runny when the plate is slightly tilted, its the right consistency. Ladle the hot jam into sterilized storage jar (refer notes) and immediately close the lid. This helps to create vacuum and seal the jars. Once the jars and cooled completely store them in refrigerator. You can try with half the recipe if you don't want to make 4 jars of jam. Don't skip the ginger and lemon zest, this gives a nice flavor to the jam. Since the blueberries were really sweet, I added only 1 3/4 cups of sugar. Adjust the sweetness per your taste. Don't make the jam too thick, it will thicken as it cools down. It is better to have a spreadable consistency for jams. To Sterilize jars - Bring a large pot of water to boil and carefully immerse the mason jars and their lids in the hot water. Make sure that you don't put the plastic coated lid into the water. Let it stay there for 5 minutes and boil. Turn of the stove and let the water cool till you can transfer it to a clean surface and dry it completely. 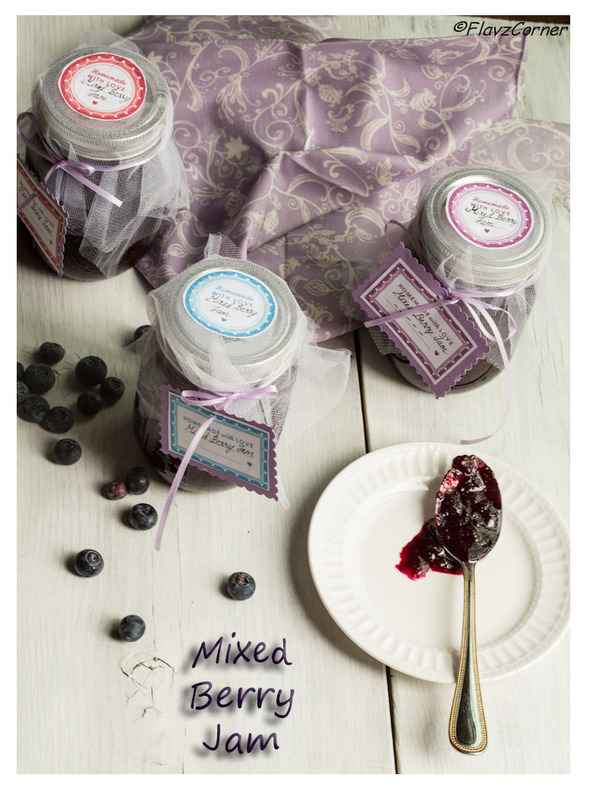 Your mix berries jam looks gorgeous. And I love that you add ginger and orange to the mix too. Lovely combination of flavor. And I agree, I can't seem to find the perfect light to take pictures of my blog either...it's not easy to catch that perfect window of light, no matter it's winter or summer. :P But I love your pictures. You did a wonderful job. Thanks Amy for the comment!! Gosh, I love the combo of flavors in this jam! The ginger in particular must be so nice. I keep promising myself that one of these days I'm going to start preserving things - it looks like so much fun! Good post - thanks. Wow Shibi, awesome!!! Love the way u've packed them, looks so festive and gifty :-), never tried homemade jam before (not much jam lovers at our home), but would love to try once. wow..loved the colur dear. and esp the click of the berries. too good. thanks a bunch for ur reply on the whipping cream. have replied..thanks once again, dear..